I’m always a little envious when I hear people talking about family traditions. We never had any traditions. So, when I heard about the Elf on the Shelf, my ears perked, and I started thinking that it could be a nifty little tradition, not only for Malissa and me, but for us to have with Stephanie, my 7-year old cousin, who is more like my niece, but you get the idea. So, here’s the premise, as told in the book that includes the elf: the elf has been sent by Santa to keep an eye on their assigned child and report back to Santa; the elf, who is named by your child, appears around Thanksgiving, and relocates within their assigned home each evening…some creative parents leave treats and little “happies” as a gift from the elf for the child; the elf is not to be touched by the child(ren) in the home, or else he loses his magic; consequences for touching the elf is that he loses his magic and must return to Santa for a period of time; the elf returns to Santa on Christmas Eve each year. It rained yesterday as I drove home to Memphis from Knoxville. I believe the angels were crying tears of joy at the addition of a new angel in Heaven, and tears of sadness in empathy for the pain we feel over the loss of Aunt Hazel. Some of my fondest memories are of spending countless days and nights at the house in the mountains, at a location aptly named Top O’ the World. The house had a screened in porch across the back, which looked out at the mountains and the valley below. Aunt Hazel loved to look at the night sky. We would spend hours just talking and looking at the moon and stars. She taught me how to identify such landmarks as the North Star, the Little and Big Dippers, Orion the Hunter, and more. Frequently, we would head over to Cades Cove with other family members to picnic by a babbling brook, sometimes even sharing our bounty (intentionally or not!) with the bears, raccoons, and skunks. Toasting marshmallows was, and still is, one of my favorite things to do. Back at the house, we would join my other aunts, uncles, and cousins, and play board games such as Trouble, Sorry, and Life, well into the night. She was a big sports fan, and we loved to talk about Tennessee football and basketball. I don’t know who I will talk to about our Lady Vols basketball team during March Madness 🙂 The world was a better place with her in it, and I was certainly a better person because of her. I will miss her greatly. Here’s an early photo along with a more recent one taken in her beloved Cades Cove in the Smoky Mountains. The world lost a great lady today, and I lost my Granny. Words cannot adequately express the size of the hole in my heart right now. My heart is aching–no, breaking–at the realization that I will never again get to hug my Granny. I’ve never met anyone quite like her. Ok, to be honest, she wasn’t my “real” granny. But’s that’s a minor technicality. I moved across the street from her 16 years ago. We’d wave at one another and talk once in awhile. She was married to her second husband at the time, and I’d get so tickled occasionally seeing this cute little white-haired lady driving this big ol’ red pickup truck. A few years later, her husband died, and I caught myself watching her house a little more closely and talking to her a little more often. I was a nurse practitioner at the time, married to my career, and not home much. She liked my dog, a fiercely protective pug named Rowdy. She longed to pet him, but he would bite anyone who tried to get close to me. One night, a little over seven years ago, I was working in the ER. I got an xray report back on one of my patients, and recognized the name. My roommate, who was also a nurse in the ER, went around to her room. “Miss Maida, just why are you in our ER today?”, I asked. “Well, honey,” she began, “I was laying down when I should have been standing up”. She seemed so small and frail, even on those small ER gurneys. She looked a little afraid. I noticed she kept looking at my little stuffed pug keychain, which I had on my stethoscope as an ID tag. I took it off and gave it to her. She smiled and clutched that little pug the rest of the time she was there. She was eventually diagnosed with a broken hip and subsequently underwent surgery and a lengthy rehab. She was so happy when she was able to return to her home a couple of months later. We visited daily, and also took care of minor things in her house for her. She’d had to use a walker while in rehab, and hated it (because she was so fiercely independent). I purchased a canvas apron and modified pockets on it. I painted each pocket to reflect something about her: for example, a pocket with gardening tools, a pocket with a pug, and a 7-7-7 slot design. She loved the pouch. Even after she got back home, she still kept it attached to her walker in her bedroom, kept it filled with toiletries, and used it daily when she showered. We were talking one day about family. She was telling us how she had grown up an only child and only had a very few family members, none of whom were living. She said she’d never had a Granny of her own and had always wanted to be one. Malissa told her that she never had a granny when she was growing up, someone with whom to do fun things. Maida looked at us and said, “Well, you’ve got one now. I’ll be your Granny, if you’ll let me.” From then on, she was Granny Maida and we were her girls. She was admittedly a bit of tomboy, preferring jeans to dresses. “They’re just more comfortable and practical”, she said. She loved to wear baseball caps with fun sayings on them and colorful socks with cartoons that changed with the seasons. She had a delightful laugh and a wicked sense of humor. We went with her to lunch, or we’d go shopping with her. She loved to go to the Bargain Barn and some of the other thrift shops, frequently purchasing little trinkets to give to friends. We went with her to Tunica. She loved to go there and play the penny slots, not so much to gamble as for the social activity of getting out, seeing friends, and having dinner. She invited us to the Family Nights at her church. We would go play dominoes, eat, and socialize. Generally, we’d just enjoy being together. She might have been 93, but she was still fiercely independent. 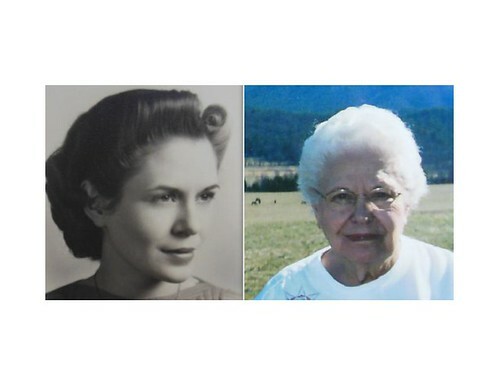 She still had her eyesight (getter than mine), still drove herself and some of her friends to the store and to eat (look out if you saw that silver bullet coming towawrd you), and still did pretty much everything for herself. One day a few years ago, I asked if I needed to changed her air conditioner filter. She said she had just done it. I asked how she did that because the furnace is up in the attic. She said, well, she climbed up the stairs and changed the filter, and Miss Winnnie (her friend who was 2 years older) stayed downstairs to help. I asked what in the world Miss Winnie could do to help. She said, “Well, honey, she could call 9-1-1 if I fell”. That was our Maida. She enjoyed it when we popped in and out. She loved our pugs. She and Rowdy eventually became good buddies. She loved to tell the story to people that even when he lost most of his eyesight and couldn’t hear very well, he would slip off, cross the street, stand at her door and “Yip” loudly. She would hear him and let him in. He would go sit in front of her chair and wait for her to come and give him treats. No one else outside the family could pet Rowdy and not get bitten. But she could. She said they understood one another. She told Rowdy they were both old and in pain but it just wasn’t their time to go yet. She cried almost as much as we did when he finally passed away. When the other pugs went over every few days to visit, she would toss Rascal his toys to fetch, and Rosie would sit in her lap. We’d sit and visit and talk about everything and nothing. We watched game shows and sang along to gospel music, especially The Gaithers. She loved her church and her Lord. Maida epitomized goodness. She showed us how to live a Christian life. She didn’t say one thing and do another. There was no doubt that she loved her Lord. She truly walked the walk. When she had the Sunday School lessons, she frequently read them to us. She enjoyed working humor into them, or finding a funny example to illustrate the lesson. She was so giving. She truly enjoyed giving of herself to others. She knitted house shoes and blankets for friends and gave large quantities of the shoes to hospitals for the patients. She told us she once knitted 250 pair of shoes one winter. The first blanket she ever made for us was a small one for Rowdy when he was getting sick. Then, one by one, she made others. She made a lovely all white one for my cousin, Kim, when she had her baby 3 years ago. She’d only met her a couple of times, but said she felt like she knew her from hearing us talk about her. She said she knew that baby would be surrounded with love, and she wanted it to start with her blanket. Kim was astonished. She said that was one of the nicest things anyone had ever done for her. Several months ago, she started giving us things. Little things at first, just saying she was cleaning this or that, and thought we might like to have something. Then she started taking a lot of things to Goodwill. One day we went over and she asked us to look thru a stack of needlepoint pictures she had made. Several were of owls, because she really liked owls and had collected them at one point. She asked us to take a few for our new house, and she was taking the rest to Goodwill. When we questioned why she was getting rid of them, and suggested she take them to church to see if anyone wanted them, she said they wouldn’t want that old stuff. Then she said she wasn’t going to be here forever, and she wanted to go ahead and clean out some things so no one would have to do it when she was gone. She gave us several things for our new home which we certainly treasure. She came over for dinner a few times, and when she looked around she would just smile to see her needlework hanging on the wall or see a lamp on her table with a doily on it that she had made. She said she gave those things to us because she knew we would appreciate them and take care of them. I don’t know what we’re going to do without our Granny Maida. There’s such a huge emptiness in me already. I’m so glad we were able to be with her in her last moments. We had seven wonderful years together. I wish we could have had seven more, but I’m so thankful for the time we had. She has made us better by knowing her. I will forever be grateful to her for all the love we shared. I know she’ll always be with us in spirit. There will never be another one like her. She was simply the best. We love you, Granny Maida.